Anise Seeds (Saunf)- A Spice with a Whole Lot of Benefits! Anise (Saunf), you must have come across this humble spice so many times in your life, but did you ever realize that this humble seeds have numerous health benefits. Most of you must have had anise after food or just as a mouth freshener, but this one is a lot more than what it seems. Anise, with the botanical name aniseed is a perennial herbal plant. 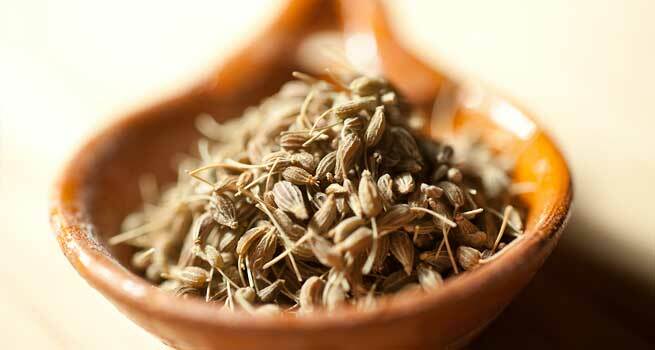 The anise is from Apiaceae family of the genus Pimpinella and has the scientific name Pimpinella anisum. It originates from Middle-East and Mediterranean region. The plant in which it grows is general about 2 feet. The plant by July bears the umbelliform flowers and once the seeds ripen the whole plant is cut. Availability of aniseed: Anise is found in both forms- whole as well as ground. It is mainly used as a flavoring ingredient in most food items. Anise is used mainly in making cake, confectioneries, alcohol and soft drinks. Other than this anise is also rich in vitamins like niacin, folates, vitamin A, vitamin C and riboflavin. It is also believed to be an important source of calcium, potassium, magnesium, iron, zinc, phosphorus, selenium and manganese. Good to cure Gastric trouble: Anise, as everyone knows is very good for gastric trouble. Just by having some anise after meals or any time can give you great relief from gastrointestinal disturbances. Provides fresh breath: Anise is rich in aromatic components like Linalool, thymol, estragole, geraniol, camphene, limonene, alpha- terpineol, alpha-pinene etc which takes away the bad odor and thus presenting the person, good breath. Good to combat respiratory diseases: Anise is a good expectorant because of the presence of thymol, anethol and terpineol. Good for digestion: The anethol present in it presents it with digestive properties. Good for inducing appetite: Anise helps to induce appetite along with helping in digestion of food. Used to treat Asthma: Anise has been used in treating Asthma because it helps in secreting the secretions in the chest due to which a person gets Asthma attacks. Great to combat cold: Having anise soaked in water can help people suffering with cold. Helps to deal with nervousness: Having anise soaked in water will help to calm down a person. Induce sexual desire: Anise is also known to have aphrodisiac property. It increases libido. To enhance the flavor: Anise is used in combination with other plants with medicinal value especially to alter the harsh flavors. To regulate menstruation: The green anise fruits are also used in regulating menstruation, especially when the periods are delayed or they are irregular. Good for cataract: Aniseed powder are known to be good for reducing cataract in the eyes provided it is consumed twice a day preferable morning and night for a certain period of time. Helps to detoxify the body: Aniseed helps the body in perspiring more and urging urination, it eliminates the waste and thereby helps in the detoxification of the body. To prevent head lice and other skin infections: Aniseed has fungicidal properties which help in preventing head lice. It is known to be one of the best antiseptics as it instantly treats infections. It is also used to treat scabies. Meanwhile anise essential oil is good for killing insects. For babies health and for lactating mothers: Anise powder helps in getting rid of hiccups in babies as well as abdominal pain. It is known to be good to induce milk production in lactating mothers. Anise is very good in a lot of ways however excessive use of it should be avoided as that will lead to dehydration.